Caption slip reads: "Photographer: Glickman. Date: 1952-04-01. Assignment: Traffic, 9534 San Fernando Rd., Pacoima. 2 shots: Officer examines car in which 1 died and 3 others crit. injured. 1 shot of hosp. attend. wheeling L. G. Corley into surgery. 2 shots of police officer and ambulance man over dead body of J. D. Jones, driver of car that rammed parked truck. 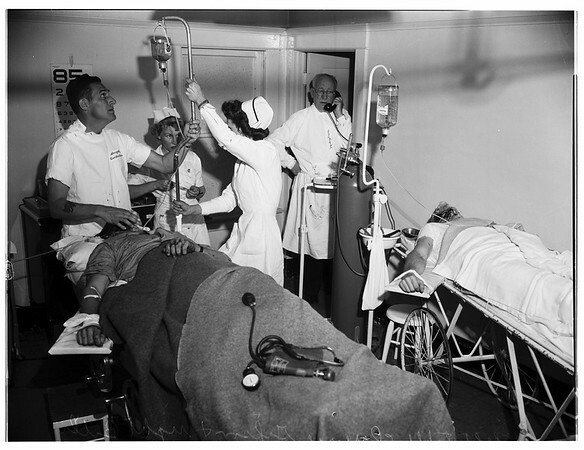 3 shots of hospital operating room. On left table is Clarence Gipson and on right is Billy B. Morse".